However, the report also pointed out the existing gap between the growth in sales of complete-knock-down (CKD) and completely-built-up (CBU) automobiles. Data showed that 13,487 CKD autos were sold in January, reflecting a rise of 69 percent from the same month last year, while the sales of CBU autos reached 6,492 units, up 110 percent. January was also the month leading to the Tet (Lunar New Year) holiday, which often sees an upswing in auto purchases and many vehicle manufacturers report record sales during the month. Toyoto Motor Vietnam (TMV) sold 4,262 units in January this year, jumping 35 percent over the same period last year and reflecting a record high sale for January in the last two decades. 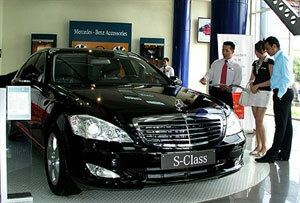 Ford Vietnam also recorded a 60 percent growth in sales over the same period last year to 1,523 units. VAMA's data showed that Thaco led car sales in January with the sale of 5,747 units, reflecting a 169 percent jump. Thaco also accounted for 35.7 percent of the market share, followed by TMV with a market share of 26.5 percent. With strong sales reported in January, car manufacturers expect higher growth this year. In 2014, automobile sales in Vietnam reached 157,800 units, up by 43 percent from the previous year.